Investing in the Team…to invest in the Community! In early 2002 David Burnby was doing some extended work as a freelance facilitator and consultant with North Lincolnshire Council’s Community Investment Team. In conversation with Team Manager Jenny Gavin-Allen, he talked several times about a Psychology course he had undertaken training in the previous Summer, An Introduction to Spiral Dynamics & Related Models of Neuro-Linguistic Programming. For David, in part at least, the course was something of a life-changing experience. Both challenged by the models presented in the workshop programme and emboldened by the understanding they gave him, he subsequently quit his lucrative position as Director of Common Purpose in Hull to fulfil his frustrated ambition of working as an independent operator. Listening to him so talk enthusiastically about the models and their applicability to community regeneration issues, Jenny was intrigued. David then let on that his enthusiasm for the course was so great he had decided to promote and stage the next programme – the third to be delivered in Hull – under his own name – thus allowing me, as course facilitator, to concentrate purely on delivery. Naturally David invited Jenny to join the workshop programme. She wasn’t quite convinced until David used Robert Dilts’ (1990) Neurological Levels model to give her a powerful insight into a particular set of problems she was having with one community group. After that taster, Jenny decided she needed to know more about these models. Like David and many others who have been through the course, Jenny found it was indeed something of a life-changing experience. With such knowledge, nothing could be quite the same again….! Pondering over how to make best use of the learning workwise, Jenny realised that she needed to disseminate the knowledge in depth amongst her key staff to create a common understanding and a set of terms – a lingua franca – they could all use. Accordingly Jenny asked me to deliver an in-house version of the course. We agreed to add two additional elements to the programme. Firstly, as Jenny was in the process of restructuring the Team, I suggested they add a session on Adizes Organisation LifeCycle and aim to apply a full MeshWORK process to the restructure. The half-day sessions were held over 6 weeks September-through-October 2002 at Normanby Hall. Those participating – Chris Barnett, Rachel Cook, Jacky Wass, Patricia Lyle and North Lincs Strategic Partnership Manager Andrea Fitzgerald – found the rustic setting of the old country house ideal ideal for letting go of preconceptions and limiting beliefs and engaging with the challenges of the models offered on the course. In many ways the programme confirmed what Jenny Gavin-Allen already knew. At peak performance the Team was a highly innovative and successful unit – its very flexibility enabling it to accommodate the typically-BLUE structures of the Council without allowing those structures to inhibit its creativity. 4Q/8L provided a model to analyse the Community Investment Team. Data was collected on the Lower Right structure using questionnaires I had developed to assess the organisation’s position on the LifeCycle and the types of roles people were expected to fulfil (in terms of Adizes’ roles of Production, Administration, Entrepreneurship and Integration). The Community Investment Team emerged as being in a state of Go-Go (under Jenny’s strong leadership) within an organisation – the Council – largely mired in Bureaucracy but in parts demonstrating ‘younger’ tendencies. The Lower Left culture was assessed using my Organisation Culture Survey, an assessment tool I had developed several years previously and which had been vetted by Spiral Dynamics co-developer Chris Cowan. 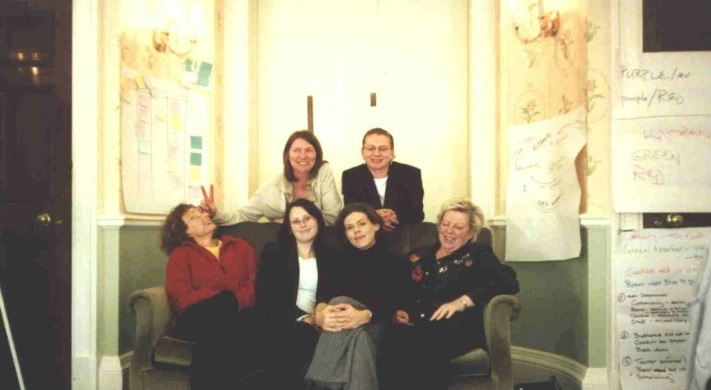 The Community Investment Team, October 2002: (back, l-r): Jenny-Gavin-Allen, Patricia Lyle; (front): Jacky Wass, Rachel Cook, Andrea Fitzgerald and Chris Barnett. Individuals (Upper Left) within the Team were assessed more informally – by simply asking which vMEME or harmonic of vMEMES seemed to dominate their thinking in the work context. It became clear from these exercises that accommodating the Council’s BLUE bureaucracy was sapping time and energy that could have been better spent on being creative and delivering services. A key exercise centred on contrasting individual vMEMES (Upper Left) with the type of job roles (Production, Administration, Entrepreneurship and Integration) people were being asked to fulfill (Lower Right). From this it was clear that people whose thinking was largely in the ORANGE-YELLOW (and beyond) range were being tied down with Administration tasks. As a result the other roles were suffering – especially the longer term function of Entrepreneurship. Those present concluded that it was only the sheer amount of Integration – driven by 2nd Tier thinking – which was holding things together, with a multi-level set of values that enabled just about everyone in the Team to buy into what they were doing. However, there was a sense of ‘firefighting’ about this. Taking the meta-view afforded by using the models on the course, Jenny and her key staff decided that they needed someone who was eminently comfortable thinking in BLUE to take the bulk of the Administration chores off the more creative types, thus freeing them up to design services which, using the Gravesian approach, they could now tailor more to the needs of their user groups. Thus, Gordon Kell was brought in effectively to be the Team’s administrator. This role was later strengthened with the addition of Karen Sweeney. Both tend to have a strong BLUE dominance in their thinking in the workplace. It could be argued that Rachel’s leaving was, in part, an unanticipated outcome of the training with me! Asked to produce a ‘5 year life plan’ (to test strategic visioning) as part of understanding ORANGE, Rachel came up with the most complete plan anybody to date had produced on any of these courses I had held previously. What made Rachel’s plan so powerful was that it embedded all the BLUE Little Detail and Procedures disciplines of SMART planning to achieve the strategic goals. Thus, having realised “It’s okay to be ORANGE!” – Rachel decamped to Business Link Humberside as a career move. Jenny, though, was phlegmatic about Rachel’s departure: “Intuitively I knew that I wouldn’t keep her forever – at some point Rachel would go. Thanks to the training, we understand now why people do certain things at certain times. Continuing health problems have prevented Jenny making as much of the MeshWORK training as she would have liked; but the positive impact upon the CIT in terms of generating greater unity through better understanding was reflected in both Karen Sweeney and Jacky Wass joining the Humberside MESH Network. 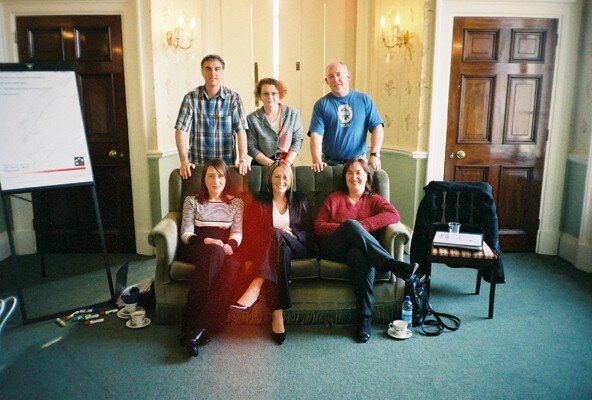 A set of photos from the October 2002 training programme can be viewed in the Career pages.